Cain Vineyards and Winery is nestled in a bowl-shaped slope, overlooking the Napa Valley from the crest of the Spring Mountain District. Jerry and Joyce Cain purchased the 550-acre piece of historic McCormick Ranch on Spring Mountain in 1980. Their mission was to create classic Bordeaux blends using mountain fruit. Cain Concept is designed to highlight Cabernet Sauvignon from the classic benchland vineyards of the Napa Valley. These benches are alluvial fan features that form at the foot of the mountains lining the valley floor. Cain believes that fruit grown on the eastern and western benches of Oakville is particularly expressive. 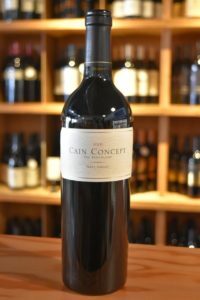 The 2008 Cain Concept is actually less than half Cabernet Sauvignon. The rest of the blend consists of 25% Merlot, 18% Cabernet Franc, and 9% Petit Verdot. The Cabernet Franc gives aromatic intensity, the Merlot adds body to the mid-palate, and the Petit Verdot lends backbone and spice. In the end, the Cain Concept offers aromas of fruitcake, plum, baking spice, and mocha. The entry, mid-palate, and finish is a seamless flow of fine, supple tannins. The balance and elegance of his wine tells a story of Cain’s simple winemaking techniques: hand-picking, gentle de-stemming, fermentation with native yeast strains, and manual pressing. The wine completed malolactic fermentation in oak, and spent 20 months in 65% new French Oak barrels. The Cain Concept would love to have at its side grilled red meats, game stews, firm, nutty cheeses, and dry cured meats.